Dan now desires more exciting battles and stronger opponents. Thus it is that when Maru appears before him, offering the two, Dan leapt at the chance. He is transported into the future, a time when Earth is threatened by demons from another dimension. Now, the fate of all humanity rests on Dan's shoulders. The price of failure is a re-set of Earth's entire timeline. The story starts 2 years after bahin dan's fight with other world king. Here Dan wins all the battleship tournaments and craves for powerful rivals and thrill of watching the spirits alive as it was possible in the other world. When he was in such agony, Mai comes from future and takes him to the future. Future world is ruled by mazoku (other world beings with monstrous appearance and powers). There is conflict between mazoku, the ruleers and mankind the slaves. MAI joined the world saving human organization where clarckey works as the captain of a ship, which he named as "beautiful sophia". Here dan's battle with Barone, a mazoku leader of rome, changes both of them. 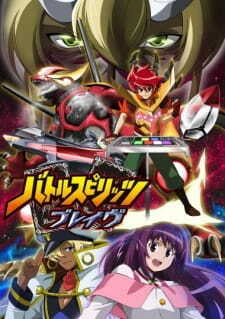 He in the future world considered a legend of battle spirits game. As the story progresses, our hero has to collect 12 zodiac cards to stop the planet from being destroyed. Sound: good. Especially you can observe it while the battle spirits fight goes on. Characters: Barone character is the one which seems to change a lot. He thinks of the humans in another perspective . Most amazing characters- though were not shown quite frequently -are the queen of mazoku and the wife of a captain of mazoku -Duke (who work hard for both the species). Both of these ladies understood their environment and planned well their future. For instance, Queen perceives that here court officials are trying for a coup d'etat, plans beforehand. She even understands others though the way they battle. She bowed to Dan when duke was defeated in a battle with Dan. She hold on to her promise with Dan. But her bow to Dan makes her to face severe consequences, she never quivered. Again duke's wife seems to understand the emotions of people around her. In the final episodes, she comforts mai well. She even accepts a human as a son so that her husband's ideal may be achieved. 1. To show Dan more mature and serious. 2. To forcefully show romantic relationship or at least hints between Dan and Mai. 3. Search for the 12 zodaic cards is not executed well. I mean to say is that for some episodes these were shown and for some Dan says we got 8 we need some more. No struggle at all shown for achiveving the cards from Suzuri's prospective. 4. Clackey is left completely side character. Finally i disliked this series. So i gave very low ratine in my watch llist.